Conveyor Cleaning – Jenkins Brushes are used to clean many different materials from various conveyor belts in many food applications. 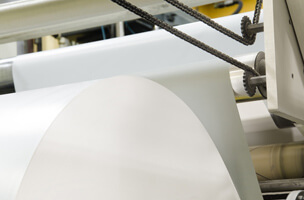 Jenkins Brushes are used for many applications in the paper industries. Hold Down – Brushes are used to hold down paper for many different uses. These brushes are usually filled with horsehair so as not to damage the paper or coating on it. 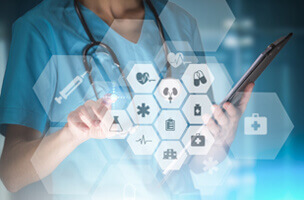 Jenkins’ Brushes are used in many pharmaceutical and medical applications. Our brushes are used to level pills, capsules and caplets as they are conveyed to packaging or counting areas. They are also used to direct the pills from one location to another. 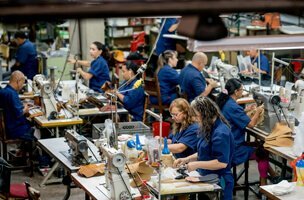 Jenkins Brushes are used in a variety of leather applications. Our brushes are used as plate washers and are filled with various different materials to optimize your cleaning needs. 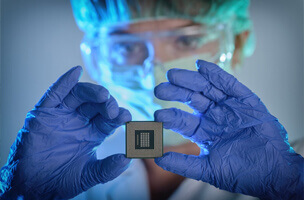 They are also used for dusting off in many applications. Void – Jenkins Brushes are used to detect voids, holes or spaces in your product. Electric charge passes thru the brush and where the void occurs the electrical circuit is completed. This determines where a hole or void is. 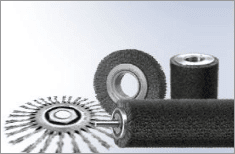 Jenkins Brushes have been used for many aerospace applications on earth and in space. Our brushes went to outer space in Skylab and on earth for seals and guards in various applications. 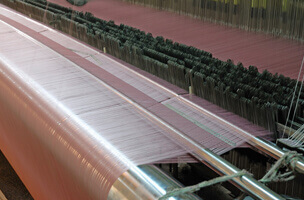 Jenkins Brushes are used in many different glass manufacturing and cleaning applications. 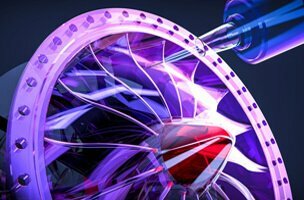 Our brushes are used to clean chips, shards and shreds in glass cutting applications. 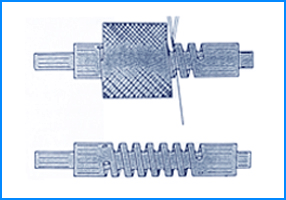 Cylinder brushes are made by taking two flat wires of which one is formed and the other is pinched and laid flat forming a cavity. 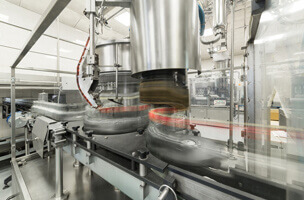 Simultaneously, adhesive is applied and filaments are set in the cavity while the assembly is wrapped around a core. 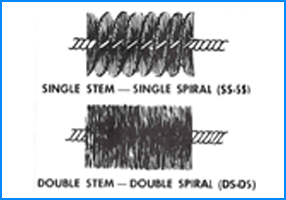 Wound brush construction is a versatile construction used in small and large diameter cylinder brushes. 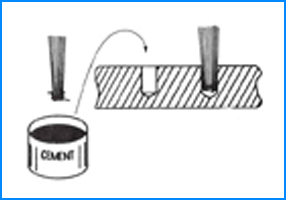 Using a steel, aluminum, brass, stainless steel or plastic core, a groove is cut in the core helically in the same manner as an acme screw thread. 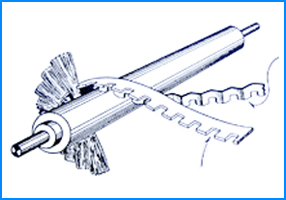 Twisted wire brushes are an important brushing tool for industry. Commonly known as test tube, bottle or tube cleaning brushes. 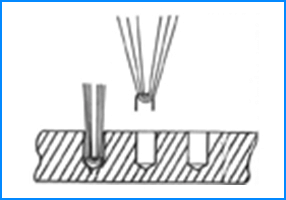 Staple set is a method of holding filaments by stuffing material into a pre-drilled hole and securing it in place with a staple. Thus, the name, staple set brush. 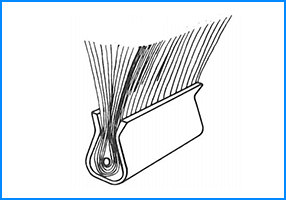 Channel strip brushes are made by taking a flat piece of galvanized steel, stainless steel or aluminum, laying filaments perpendicular to the sheet metal then laying a central wire parallel to the sheet metal and then clamping the sheet metal around the retaining wire. Wire Drawn is an extremely versatile and sturdy construction. 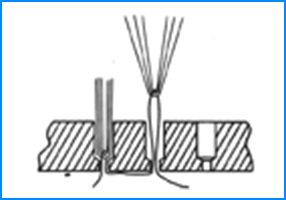 Filaments are held in place by a continuous wire or nylon retaining cable. Two holes are drilled in a substrate. The strongest and sturdiest industrial brushes money can buy are epoxy-set brushes. A single hole is drilled in a substrate, filaments are bundled and dipped in epoxy and set into the hole and allowed to set up. 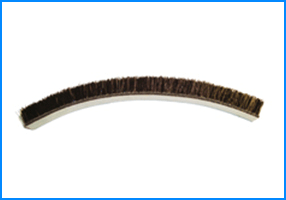 Jenkins’ flexible belt brushes are synthetic or natural materials mounted in a backing of urethane or leather. 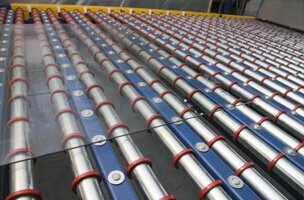 They are made to bend around survices to protect your product against being damaged by rails or or sides of conveyors or to clean or hold your product, just to name a few uses. Jenkins’ acid brushes are general use brushes made by filaments crimped in tubes to form a handle on one end and a brush at the other end. 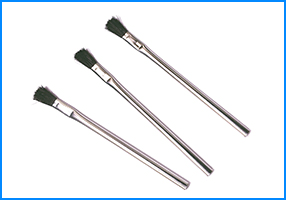 These brushes are used in a multitude of different applications and are available in different sizes and horsehair or nylon fill.